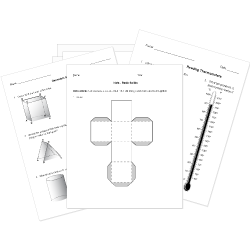 You can create printable tests and worksheets from these Grade 2 Area questions! Select one or more questions using the checkboxes above each question. Then click the add selected questions to a test button before moving to another page. Which shape covers the most area? Mrs. Turner uses the carpet squares shown below to cover the floor of the reading center. How many carpet squares does Mrs. Turner use to cover the floor area of the reading center?